Which art prints are we talking about? Not the ones you might expect. Among our most popular collections of unexpected items you can borrow from the library is our circulating art prints collection, housed on the 2nd floor of the Robbins Library. No matter what course of action is taken on Warrant Article 39, we will continue to support the circulating art print collection which allows library patrons to borrow a framed art print for six weeks at a time. Warrant Article 39 refers to a collection of approximately 150,000 art prints amassed by Winfield Robbins during his travels to Europe–mostly portraits of European aristocrats purchased indiscriminately in bulk. At the time of his death in 1910, he left the prints as a gift to the Town to be held in the Robbins Library. They are still here. Although they have consistently declined in value, do not relate to Arlington in subject matter, and have proven over the years to be of minimal interest to the community and to collectors, these prints remain housed in the Robbins Library. Put end to end, they would cover over 30 miles. Stacked, the tower of storage boxes would reach 13 stories. 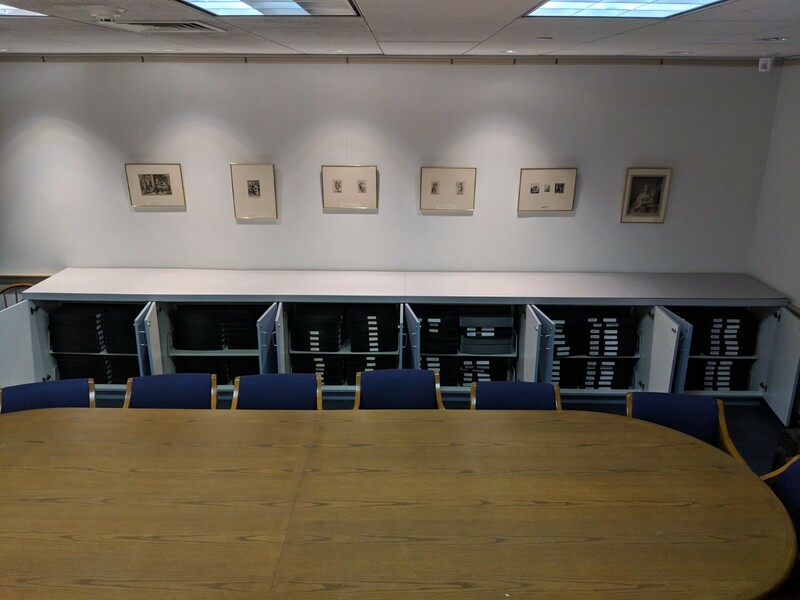 This vast collection of prints occupies space in our 4th floor conference room, a room off the 4th floor rotunda, shelves in staff offices, and an attic storage space adjacent to the Local History Room. None of these spaces were designed for art print storage. As far back as 1925, concerns were expressed about the maintenance of this collection and every decade since, Library Trustees and Library Directors have struggled to find use for it and to maintain it in accordance with Winfield Robbins’s original bequest. The collection came with a very specific bequest for the “care, preservation, increase and purchase of his print collection” ($25,000 in 1910, now worth approximately $684,000) and his cousin Ida Robbins also provided a bequest for “the purchase and care of Prints” ($30,000 in 1949, now worth approximately $548,000). To “deaccession” means to sell or otherwise dispose of an item in a collection. This is common practice at museums and other institutions. In public libraries specifically, it’s known as de-acquisition or weeding the collection. As we purchase new materials to meet the needs of our patrons, we weed the collection according to professional standards and guidelines as explained in our Collection Development Policy. There are exceptions of course, for example we treat our Local History collection more like an archive. The Winfield Robbins Art Print collection is not part of the library’s circulating collection nor does it fit the criteria of our Local History collection. If the warrant article were approved, the Library Trustees and Administration would move forward in trying to sell or give away the Winfield Robbins prints. As the prints are Town property, any funds secured would be directed into the Town’s general fund. If feasible, the funds would be earmarked for continued support of the libraries, as was Winfield Robbins’s original intention. The Town is working on a parallel process with the Attorney General’s office to review the bequest language and determine if the original purpose has been frustrated, given that the Board of Trustees and the Library has been unable for decades to use any significant amount of the funds towards the narrowly stated purpose. If that request were approved, the funds would be eligible for some other, yet to be determined, use in support of the Library. With significant renovations proposed in the coming years, the Board is hopeful that the Library would have access to these funds to help reduce the burden on the Town. Furthermore the use would still be well aligned with Winfield Robbins’s desire to support the Library. It may surprise many to learn we have this massive collection of art prints, but it will probably surprise no one to learn that we are not equipped or staffed to curate a collection of prints larger than the collections of many dedicated art museums. We are, however, equipped and staffed to offer public library services to the Town of Arlington and we do so with energy and commitment to our ever-evolving community of patrons, many of whom love to borrow thermal cameras, puzzles, spiralizers, and yes, framed art prints. This entry was posted in Reimagining Our Libraries, Uncategorized, User experience and tagged framed art prints. Bookmark the permalink.